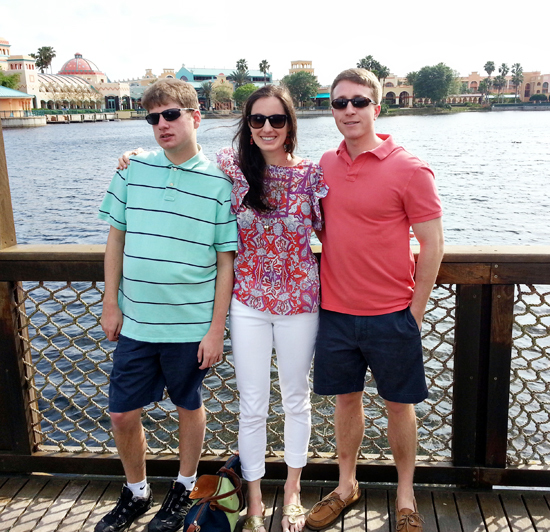 As many of you may know, I’ve taken an annual trip to Orlando with my brother Scott and fiance Ryan for the past 3 years. This year rounded out our 4th year of the spring break tradition, and since I’ve shared our trips in the past with Mickey Mouse Cupcakes and Butterbeer Cupcakes, I thought this year it was time for princesses. Disney World’s Magic Kingdom opened their newly expanded Fantasyland last December, and since it is the home to all of the princesses, I figured these darling cupcakes would be a great homage to this new land of pixie dust and fairy godmothers. The three of us have had such a blast on our trips, this year was no exception, and it’s nice to share my memories with all of you through some Disney-themed baked goods. So in order to honor my two favorite boys and our fun times together, the obvious choice is princess cupcakes, right?? Now it may seem a little bizarre that a girl in her twenties would choose Disney as a spring break destination for four consecutive years, but 1) I love the place (it’s truly magical), and 2) my brother is absolutely obsessed. When my grandparents spent their winters in Florida, my family would visit them in Boca and then always made the trip to Orlando for a few days at the parks. So after all those years, Scott grew accustomed to the annual trip to visit Mickey (I’m pretty sure I’ve been almost 25 times…). For those of you who may be lucky enough to know my brother personally, he is a total doll and jokester with some intellectual disabilities. He’s 20 but reads at about a 2nd grade level and can’t quite grasp things like money and time (yet). He’s truly a kid at heart and Disney World is his absolute favorite place. My Mom doesn’t share our fascination with this magical land however, so for the past few years we’ve let her stay at home with my Dad for a relaxing weekend while Ryan and I took Scott on vacation. It’s definitely a win-win situation. And when you add cupcakes to the mix, it becomes a win-win-win. On a slightly unrelated note, a lot of people ask me when I knew Ryan was “the one”. And as cheesy as it may seem, I actually have an answer. When we took our first trip to Disney together with Scott, just the 3 of us, it really dawned on me what a great guy Ryan is. Without my parents around, Ryan had to assume a quasi-authoritative role with Scott, rather than just playing out the part of fun older brother, and it definitely tugged at my heart strings. My future will forever be intimately tied to my brother, and if Ryan was going to join that future, he had to love Scott almost as much as I do. Seeing them together on these trips helped seal the deal for me, and I’m very confident there are many more to come. Scott LOVES taking pictures with characters at Disney, and I desperately tried to get a good one with the princesses to go along with this recipe, but they didn’t come out very well and I much prefer this one of us all cleaned up before dinner at our hotel Coronado Springs. 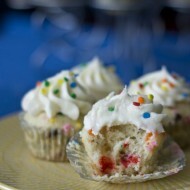 As for the cupcakes, they were so much fun to make and really quite easy too. I found some images of the princesses online (I chose the classics – Belle, Cinderella, Sleeping Beauty, and Snow White) and printed them on cardstock. After cutting out the shapes (that part was kind of tedious) I taped a lollipop stick to the back and voila – princess toppers! For the skirts of their dresses I replicated the technique I used for the anemone flower cupcakes, but just did 2 layers with the top one being slightly smaller. I think it added the height I wanted without a giant mound of frosting and really looks like a princess dress! You can’t really tell from these photos, but they’re also sprinkled with a TON of disco dust and this was really, really pretty in person. If you’re making these for a party or something I highly recommend picking up some of this edible glitter because it truly makes them sparkle. Just like one of the little girls coming out of the Bippity Boppity Boutique! Of all the Disney princesses, my favorite has to be Belle. She’s smart, witty, beautiful, brunette, and she loves yellow just like me :) Who’s your favorite?? Bake the cupcakes according to the recipe's instructions and prepare the buttercream as well. I chose to bake the cupcakes in liners that were color coordinated with the princesses' dresses, so feel free to do that too! If you're doing the 4 princesses I did, divide the buttercream in fourths and dye each one light pink, light blue, light yellow, and a more vibrant yellow. 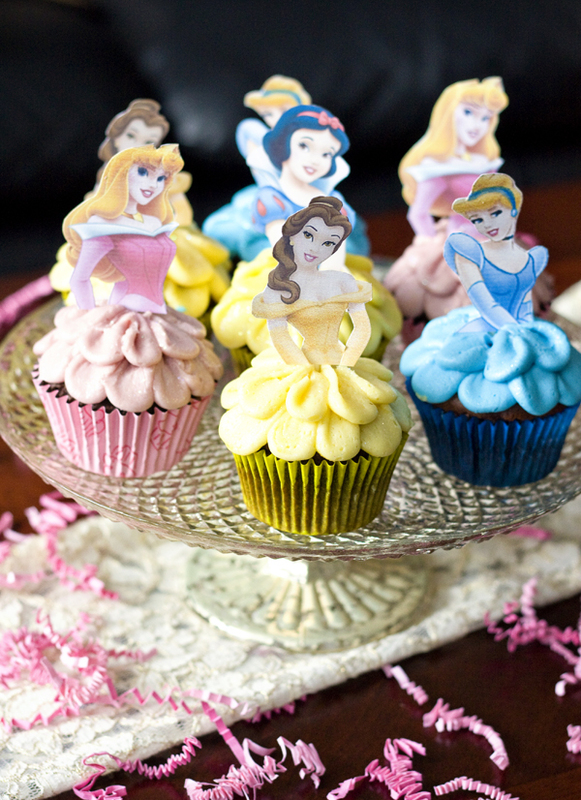 To make the toppers, print out pictures of the heads and body of the princesses of your choice on thick paper. Cut them out and attach a lollipop stick to each one with clear tape. 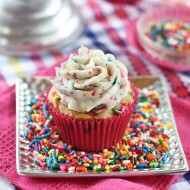 To decorate the cupcakes, fit a decorating bag with the large petal tip and load the buttercream in. First pipe large "petals" around the top of each cupcake that go all the way to the edge. I found this tutorial very helpful for learning how to pipe petals like this. Then, for the second layer, make them slightly smaller so they don't extend quite as much. Sprinkle with disco dust and stick in the topper! So cute! We were down in Orlando over winter break, to see harry potter, maybe it’ll be the princesses next time! Did you save the links for the princess pictures? And as always, love your blogs and thanks for being an inspiration! Finally the first one to comment! I didn’t save the links, but if you just google image search for the different princess names, there are a ton! So glad you like them, have fun in Orlando next winter!! Soooo cute…I love these cupcakes! That’s so lovely about your fiancee and your brother. Your cupcakes are adorable! These are beautiful! I love that technique and I was thinking about trying it in a cupcake bouquet–I bet it would be perfect! Wow, what beautiful cupcakes! And what a beautiful post to go along with it…thank you for sharing :) I must say that Cinderella has always been my favourite Disney Princess. But having said that, I have just spent the afternoon watching Snow White and the Seven Dwarves, as well as Beauty and the Beast! Hehe. So glad that you had a wonderful vacation (Magic Kingdom truly is magical!). You look very handsome Scott!! I LOVE your Disney posts as I’m a huge Disney fan as well. My family and I have been going there every other year since I was in the 7th grade! My husband and I went there on our honeymoon and now he’s hooked as well! I love how you decorated the cupcakes! Definitely saving this one in my back pocket. I’m giving my youngest daughter a surprise party for her 21st birthday at Chuck E. Cheese with Disney Princesses as the theme. She’s never had a surprise party and teaches dance to young girls so I decided to include her students. These will be perfect! The studio’s recital is on her actual birthday so this will be a week early. I’m sure she’ll have a more “adult” celebration after but I’ll be willing to bet this will be her favorite. Thanks for the great idea! LOVE THIS! I am making them for my daughter! How tall are your princesses? I don’t want them to look like giants on the cupcakes :) hehe. Thanks! I would say about 3″ tall. Good luck, I’m sure she’ll LOVE them! I loved your story about your brother Scott and Ryan. I have such a similar story that when I read yours it struck me. I felt the same way about my husband when we were dating and I saw how he embraced my sister , who has special needs. Other boyfriends and even friends had trouble accepting her but David from the moment he met her loved her, hugged her, and never was afraid of her like so many others. That’s also too when I knew he was different and the “one”. We too are a Disney family and actually both my husband and I worked at Disneyland for a period of time. Our most cherished memories are when we ( my sister, David, and I) spent time together at the park. Best wishes! I absolutely love these!! These have given me an idea for my boyfriend’s daughter’s H. School graduation party in June. Not being a baker, but someone who can bake cupcakes, can you give me any ideas for a gown on top of a cupcake? Maybe with her picture on top of the gown (gown in frosting)? Do you think this is possible? Any suggestions?? Thanks! I sow your cupcakes and love it and when I read your history with you brother I got realy moved. Thank your beaultiful history. I got a lite boy and he has some problems. May I make some cupcakes just like yours ? 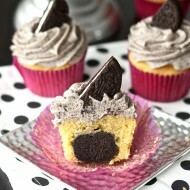 Thanks for the nice comment, please do make the cupcakes! Best of luck!! I’ve got everything ready to try these for my daughter’s 3rd birthday this week. So excited and hope they look as half as good as yours do. She is going to freak out – all I’ve heard about for months is how she wants princess cupcakes for her birthday. She hasn’t seen these pictures but I know she will be in awe! Thanks for sharing this with a fellow Disney nut! Muito bonito e criativo, adorei. Love your princess cupcake !!! I would like to make this for my friend’s little girl birthday. But i cannot find this kind of Disney Princess images for printing, Could you mind to share the link to me? Here are the links I used! Love the cupcakes! Where did you et the printouts for the princess faces?? Is there a place I can get some of the other Princess? Would like to have all of them if possible? How did you find the links to get them? Hi. 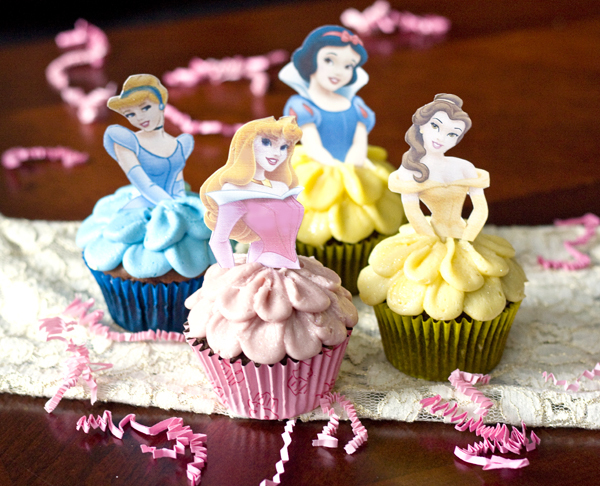 Just want to ask, if i am to use a 3 oz cupcake, what is the height of the princess printable you used? When you printes them did you make adjustments on the size or it just came out that size? I think the princesses themselves were about 3″ tall. I did adjust them in Word before printing them so they’d be proportional to their cupcake dresses. Good luck! That’s a good idea! But the link to the picture isn’t working because it says I don’t have access to view it. Would love to see it!! I made these for my 3-year-old for her birthday/Easter celebration today. Since I didn’t buy her a gift, I got a few of those little plastic princesses and Barbies they sell at Target. I just took off the tiny dress and stuck the plastic princess in the cupcake. And then she has something to play with after I wash them off. Kind of like the giant Barbie cakes people used to make when I was a kid…but your method is easier and cuter. Also, I found your site by searching images for “princess cupcakes”. It startled me when I saw ‘Erica’s Sweet Tooth’ in my website tab…since I’m also Erica and known for my sweet tooth. I was afraid google had profiled me too much! I love your cupcakes! I wanted to make some of these for my daughter’s birthday, but I’m concerned about the paper soaking up the grease from the buttercream frosting. Did you find that was a problem? Thanks! I think it may become a problem if you assemble them too far in advance. Maybe just stick in the toppers shortly before serving? Is that a possibility? I left mine in overnight and didn’t see any bleeding if that helps! Thanks so much. That does help! Are you able to email the toppers? 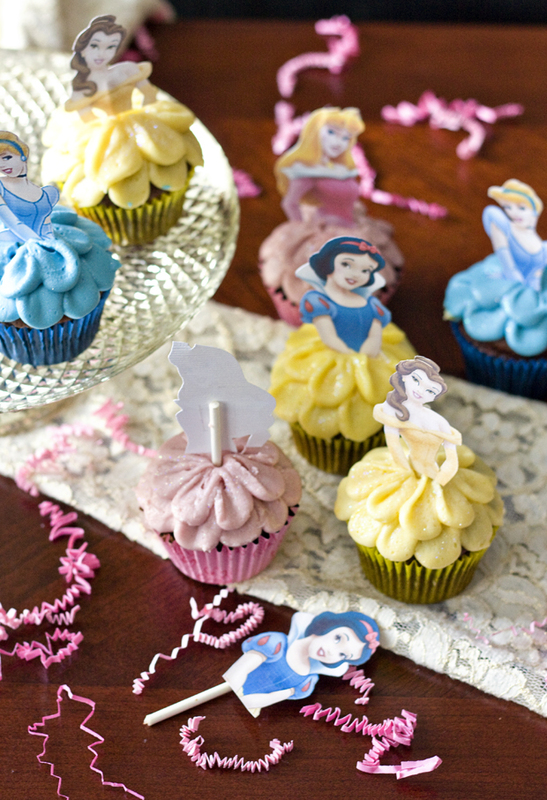 The Disney Princess Cupcakes are easy to make and I can save money by making these myself instead of going to the bakery for character cupcakes.